As you may all know, Grade Point Average (GPA) measures your academic performance in college. Some employers may use GPA as a key factor when hiring college graduates. Therefore, it is extremely important for you to maintain a good GPA throughout your college career. There are two types of GPA you should be aware of. One is Term GPA, which computes GPA of the courses you take each semester. Overall, GPA, on the other hand, is the GPA you have accumulated for all the semesters you have attended UTEP. Both Term GPA and Overall GPA are shown on your grade report at the end of each semester. Even though we have told you that a GPA of 2.0 or above will keep you off probation and suspension, it is best you maintain a GPA as high as possible. The higher your GPA the better. This will open more doors of opportunity when you apply for co-ops, internships or postgraduation jobs. In order to calculate your GPA, you need to know what grade points are and how they are used in GPA calculation. Every letter grade is assigned a fixed numerical value. This numerical value is what we refer to as grade points. 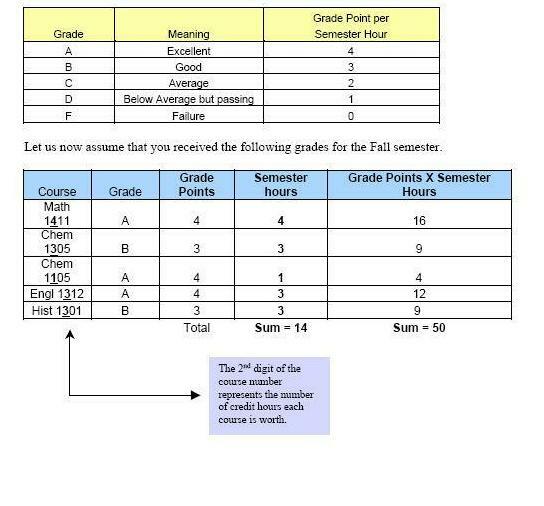 The following table shows the grade points for all possible letter grades. Making the Dean’s List is definitely a good thing. To make the Dean’s List you have to earn a 3.5 GPA at the end of the semester and have taken at least 12 credit hours. Academic probation is a term used to describe a student’s standing when the GPA goes below the minimum GPA of 2.0.What happens now? Probation is the term used when a student’ s GPA falls below a 2.0. The student will need to get permission from the dean of his/her college to re-enroll. How does a student get off of Probation? A student can get off probation by bringing up the GPA to a 2.0 or above. At this point, the student will be eligible to re-enroll for the upcoming semester without prior permission from the dean. Suspension is the academic term used to describe a student who is on academic probation and whose term GPA is below a 2.0. When this happens, a student will be suspended for one semester and will not be able to re-enroll until after the one semester is up. Then the student can petition their department for reinstatement. This means that a student will need permission from the dean of his/her College to re-enroll. If a student has been suspended for one semester, returns to UTEP for one semester and still has less than 2.0 GPA, then the student will be suspended for one year, which means that the student will not be allowed to register for any classes at UTEP for one full year. After the one year is over, the student can choose to petition his/her department for reinstatement. If approved, the student will be allowed to re-enroll for one semester on academic probation. The dean of the student’s college may also impose certain restrictions such as the amount of hours the student can register for or set a certain GPA standard the student must achieve for the semester. If a student still does not do well in the semester following the one-year suspension, then the student will be suspended for two years. After the two full years, the student can choose to petition the department for reinstatement. If approved, the student will be allowed to register for classes probably with some restrictions and expectations as mentioned above. How does a student get out of suspension? 1. Meet with the academic dean after the suspension period. 2. Maintain an overall GPA of 2.0 or above.